Lots of rain means lots of non-runners today, and a change of going to soft, which might become heavy soon enough. 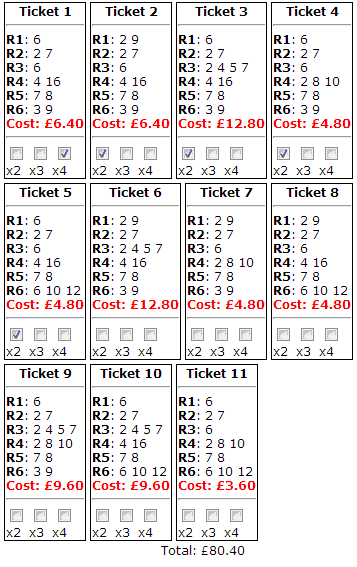 Perfect conditions for crafting a contrarian placepot wager! 2.05 - Leg 1: We start with the Listed Rose Of York Stakes over seven furlongs. Four absentees so far bring us down to six runners, and two places. Sirius Prospect is the one that will appreciate the rain the most: he won in this grade over six soft furlongs back in 2011, and has plenty of placed form on soggy to back that up. He'd been in the doldrums somewhat before a win on his penultimate start, and had a horror draw in the Betfred Mile last time. Dropped back in trip and on ground he enjoys, he's a big chance today. On B, I'll risk the Fahey pair, Switcher and Fort Bastion. Both have form with give, and both are capable of more than they've shown lately. Current favourite, Rex Imperator, is a very nice horse but he surely doesn't want it this slow, and if he goes off jolly could take a fair amount of non-runner cash out of the pool with him. 2.40 - Leg 2: The Melrose Stakes, and I know Tony will be gutted that St Leger aspirant, Great Hall, is a non-runner because of the ground. He's joined by four other defectors, leaving a field of eleven and three places. The trio with winning form on the ground are Mister Impatience, Dashing Star and Divergence. Mister Impatience is clear pick on form of the trio, but has plenty of weight to lug as a consequence. He'd previously won two soft ground races by a combined fifteen lengths (! ), and is an obvious A play. Havana Cooler ran second on debut at a huge price on soft ground and, by Hurricane Run, should be fine on this sort of loose terrain. He's progressive and has Ryan Moore steering for the first time. 3.15 - Leg 3: Seven run in the Group 2 Gimcrack, a race that is always hard to solve and more so this year with a number of unknowns on deep ground. The one known commodity on the surface, and with Group race form is Parbold. Saayerr's trainer, Willie Haggas, was less than confident on The Morning Line this morning about the ground for his horse, who is the Richmond Stakes winner. Wilshire Boulevard represents Ballydoyle and he ought to go in the ground, though it's a bit of a punt. Likewise Astaire, for whom this is a step up (no pun intended), though he has taken solid support. My Catch won a nice little Group 3 in France last time, and could lead here; and I don't think Justice Day is out of it either. Very tricky, and I'm spreading out and looking for a result. 3.50 - Leg 4: The Ebor. But a gettable one, with a glut of non-runners. Number Theory and Opinion will both enjoy the ground, and have touches of class. Irish raider, Ted Veale, will love the ground and the trip, and is in form. He could win if not knackered from a run just three days ago. Oriental Fox is a stout German bred, by Lomitas, and was third in a Listed event at Baden Baden earlier in his career on soft. He's been running well and if you forgive his Goodwood run, he's been very consistent. Genzy drops down in class and is quite attractively weighted over a trip he should love. He has won on soft before, and makes B. 4.25 - Leg 5: The favourite, Outer Space, is a non-runner now, so two places between six remaining contenders. No soft ground form on show, but Mecca's Angel did win at Southwell - a deep testing track - and by twelve lengths to boot. The down side is that that win was in Class 6, and today she's in a Class 1 Listed race. That's a fair old leap in class! The ground is a question mark with all of the rest, and Excel's Beauty arguably sets the form standard on her second to Wind Fire in a Newbury Listed race. That one ran third in the Group 2 Lowther, having previously chased home No Nay Never at Royal Ascot. A. On the basis of cluelessness, I'd love to add the other two non-rags to B, but we've got to take a chance somewhere! 5.00 - Leg 6: And so to leg six, a ten furlong handicap where eleven remain standing at time of writing. The soft ground horses are Charles Camoin and Spirit Of The Law, and both are within spitting distance of their last winning handicap marks. Sennockian Star is very high in the weights now, but has been so consistent that it's impossible to rule out another placed effort. And Forgotten Hero is one that could just go well at a big price, especially with Spencer at the wheel.